Welcome back, folks. I hope y’all are enjoying drafting Guilds of Ravnica and trying out some of the new cards in Standard. People seem excited about this set, and both the Sealed and Draft leagues are at healthy participation levels. At one point during the pre-release there were nearly 12,000 people in the Sealed leagues, and already the competitive Draft league has 675 people in it. Limited participation levels on Magic Online were at their highest levels during the first month of Dominaria‘s release, and I’ll be curious to see how Guilds of Ravnica participation does by comparison. Lost in all the Guilds of Ravnica hype last week was an update to the treasure chests! 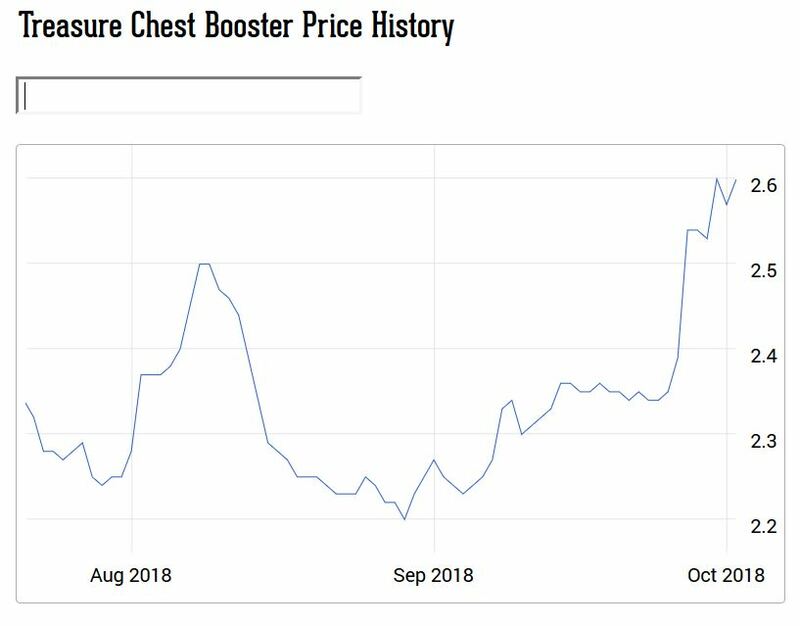 Medwin has taken it upon herself to reverse the overall trend of declining treasure chest values, and since taking over the chests have not fallen below 2.20 tix. Treasure chests shot up to 2.60 tix after the update went live, and I’m here today to break down the important changes. As has become traditional, many Core 19 mythics and rares were added to the chests at the release of Guilds of Ravnica, rares at a 6 frequency and mythics at a 12. To provide a frame of reference, generally only a frequency of 18+ will pump enough copies into the market to create excessively burdensome downward pressure on a Standard staple, 12+ on a Modern or Pauper staple, 6+ on a Legacy staple, and 6+ on a Modern or Pauper playable. I tend not to invest in cards that exceed the stated thresholds so that I’m not fighting against the current. A few things pop out. First is that Bone Dragon and Chromium, the Mutable are the big winners in the mythic category. Cards with less demand than those two are having an additional infusion of supply, and this makes me happier about my Chromium speculation recommendation a month ago. 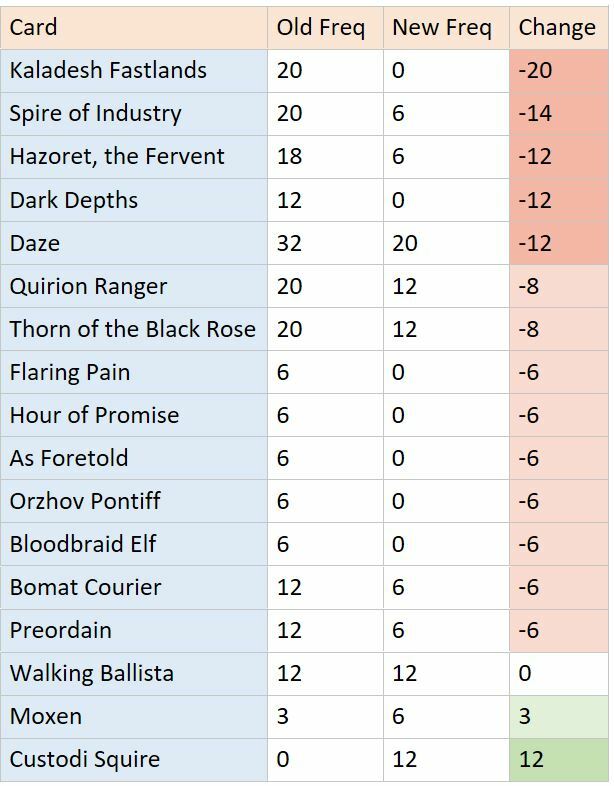 Second is that Crucible of Worlds and Scapeshift are going to continue to have supply pumped into the market, so I would steer clear of these cards and would sell any excess copies I have (I’m surprised these two were added to the chests despite the Core 19 reprinting. The opposite approach was employed with Masters 25 cards). These three cards are the big winners in the rare category, as they are the most expensive rares that avoided inclusions in the treasure chests. Banefire and Cleansing Nova, in particular, are shaping up to have been among the best speculations of Core 19, as both have seen play in the opening week of Guilds of Ravnica Standard. As fun as it may be to ruminate on the topic, I’ve grown to learn to avoid assuming that cards not included in the chests will not see Standard play and those included in the chests will see Standard play. These decisions seem to be made by looking at which cards are expensive and which cards are, like Graveyard Marshal or Tezzeret, Artifice Master, “objectively powerful” without reference to what Play Design or the Future Future League divines will see play in future Standard seasons. Apart from the addition of Core 19, Standard cards are not having their frequencies changed all that much. The main thing we see is the addition of some popular Rivals of Ixalan cards and the elimination of some Dominaria cards that don’t see play. I don’t think there is too much to worry about here. 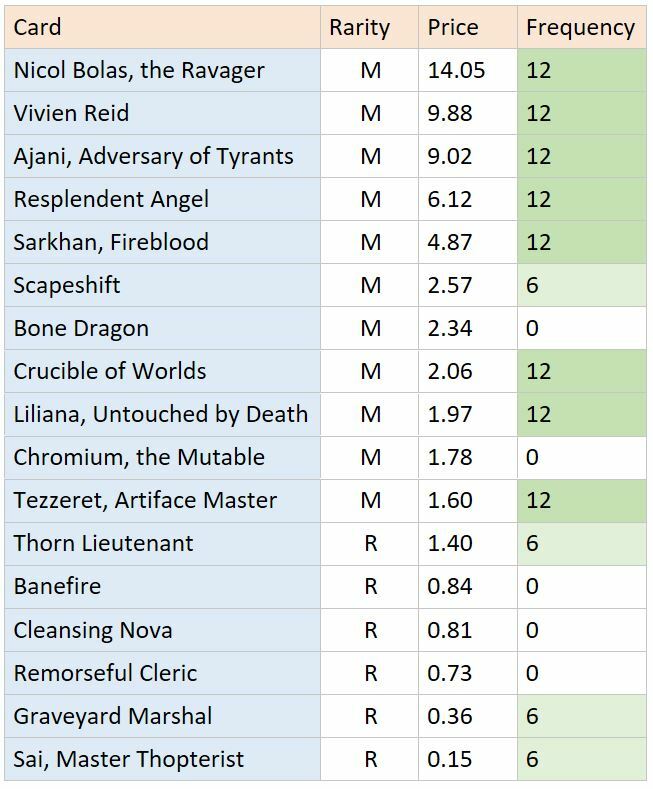 I think that a 6 frequency for The Immortal Sun and Arch of Orazca will really limit their potential to increase in price going forward; I think that a 12 frequency for Teferi and Rekindling Phoenix will not prevent those cards from going up, although I think it will gradually lower the ceiling on both cards. I’d look to sell the Phoenix between 30 and 35 tix, and Teferi between 40 and 45 tix. Standard now only has three cards with a frequency of 20 or higher, and those three are Carnage Tyrant, Vraska, Relic Seeker, and Vraska’s Contempt. I believe that these three cards should have had their curated frequencies reduced to 12 to put them in line with other Standard rares and mythics, and I hope that Medwin will make that change at the next Treasure Update. I certainly forgot that these three had such high frequencies, and I’m now looking to sell my copies at lower prices as a result. I’ll likely sell my extra copies of Carnage Tyrant at 15 tix, Vraska’s Contempt at 8 or 9 tix, and Vraska herself at 8 or 9 tix. There are many changes to Eternal cards, too many to go over. Below are those that I think are the most significant. Sometimes, as in the case of Walking Ballista, the significance lies in what stays the same. I usually find some speculation opportunities in the crop of major treasure updates, and today’s is no exception. Spire of Industry, Bomat Courier, the fastlands, and Thorn of the Black Rose are all cards I’ll be looking at more closely over the coming days. Dark Depths, with a new frequency of 0, might be my favorite of them all. These three are the big losers. Custodi Squire, in particular, is going to get hammered. 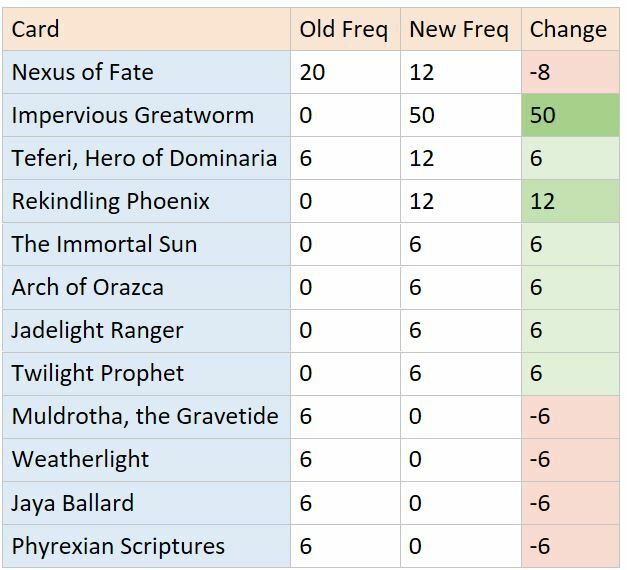 I’m very confused by the decision to increase the treasure frequency of the Moxen, as even a 3 frequency is high for Legacy and Vintage cards. I’ve long been vocal about Magic Online needing a Legacy League with the payout structure of Pauper and Friendly Standard/Modern Leagues to spur demand for Legacy cards. Walking Ballista now looks like a much worse spec than it did mere weeks ago as it will face significant downward pressure ad perpetuum. Hold onto your playset and sell the rest. Thanks for reading. If you have any questions, leave a comment down below or hit me up in the QS Discord and I’ll be sure to get back to you. Next week I believe we’re going to take a look at a topic I’ve been asked about a lot: What will happen to the price of the Guilds of Ravnica and Ravnica Alliance Shocklands? Stay tuned!